We took a trip to Tibet late last year. Tibet is stunningly beautiful with natural mountains and lakes that you can not find elsewhere. However, it is not an easy place to get into and you must be flexible with your plans and willing to absorb the risk that you may not be let in at the last minute. However, when you make it there you will surely have an eye-opening experience. To help you plan, today we’ll share our itinerary for Tibet. In the upcoming posts on the remaining Mondays in July, we’ll give you some tips on how to get into Tibet, and provide highlights of our trip so keep watch for that if you’re interested in Tibet at all! We spent six days in Tibet last year and we spent all of it in Lhasa for several reasons. There is so much to see in and around Lhasa that you need a full six days in Lhasa to see it all. Furthermore, unless you’re going on a trek to climb Mount Everest, everything you would want to experience about Tibet, you can find in Lhasa. And lastly, there may be different permit requirements if you wish to travel far outside of Lhasa. So make sure you coordinate with your travel agency in advance. If you would like a more authentic tour experience, consider requesting the service of a tour guide who is a Tibetan. This way, your tour money contribute to the well-being of the Tibetans directly. Our trip to Tibet consisted of visiting the major monasteries that taught us a great deal about Buddhism and the Tibetan culture. We walked around town to get a sense of modern Lhasa and we traveled just outside of town to view the natural beauty of Yamdrok lake. Get a prescription for Diamox before leaving your home country and start your treatment two days before arrival in Lhasa. It worked for us as we had no problem acclimatizing to the altitude. Diamox does make your finger and toes tingle though! Day 1: Fly into Lhasa and Acclimatize! Fly into Lhasa airport (LXA) and take it easy today. Lhasa is at a high elevation of 11,450 ft., so you will need at least a day to get used to the thin air. Do not plan any strenuous walking or physical activity even if you’re feeling well. Get to Potala Palace by 5pm and register for your admission ticket for use on the following day. Present your passport and make sure to get a receipt. Tickets are limited, this is why you must get your tickets the day before. Walk around town, be polite, stay low key, and observe life. Take pictures of the exterior of the Potala Palace. For dinner, catch an authentic Tibetian dinner in the Barkhor Circuit. Try some momos and yak butter tea if you are adventurous! Get to Potala Palace (布達拉宮) by 9am. Potala Palace was the chief residence of Dalai Lama until the 14th Dalai Lama fled to Dharamsala, India in 1959. The most stunning chapels of the Red Palace house the jewel-bedecked chorten tombs of previous Dalai Lamas. The quarters of the 13th and 14th Dalai Lamas in the White Palace offer a more personal insight into life in palace. Leave at ~12pm. Next take minibus 301 or 302 to Drepung Monastery (哲蚌寺). This is the largest monastery in the world, with more than 7,000 monks living there. Leave by 3pm. Take a 10min walk downhill to Nechung Monastery (乃穹寺). The Monastery closes at 4pm so hurry. You might have the chance see the monks debating in Tibetan! If not you may be able to see a debate at Sera Monastery the following day. To return to Lhasa, take bus no. 302 from Nechung Monastery, or bus no. 301 from the bottom of the hill. Arrive back to Lhasa by 5pm. In the evening, try shopping for souvenirs & have dinner at Barkhor (八廓) – a Kora pilgrim circuit that proceeds clockwise around the periphery of the Jokhang Temple. The Barkhor is one of the best places to pick up Tibetan souvenirs such as knives, prayer wheels, Buddhist statues, jade jewelry and the latest music from India. Be transported to Ganden Monastery via 4×4 SUV. Arrive at Ganden ~9am. Tour for ~2hrs. Ganden is a photography heaven – lots of colors, lines, textures and all in service for the monks in their red robes. The Ngam Cho Khang Chapel where Tsongkhapa traditionally taught his students. You must walk the High Kora (~1hr). The path is signposted by a rich array of colorful prayer flags fluttering in the breeze. Ask your tour guide to teach you about sky burials. Take SUV back to Lhasa, arrive ~2pm. Be dropped off at Sera Monestary to see the monks debating. Free time in the afternoon/evening. You may want to drop by Spinn Cafe to have a delicious hot lemonade, get some free wi-fi, and socialize with other visitors! Walk to Jokhang Temple (大昭寺) in the morning. Arrive by 7:30am for 8am entry. See the pilgrims prostrate on the ground outside the temple (best in morning). One of the main attractions is the main cloister with a ring of large prayer wheels, kept spinning throughout the day by pilgrims. However the cloister that leads to the central hall, contains Jokhang Temple’s star attraction, the Jowo Rinpoche (or Jowo Shakyamuni). This life-sized (5 foot/1.5m) statue of the Buddha at age 12 is the holiest object in Tibet. Probably originating in India, it was brought to Lhasa as part of the Chinese Princess Wencheng’s dowry in 641. Go up to the roof for a fantastic view of Lhasa and the snow capped mountains. Leave by 10am. Take a cab ride to Norbulingka, former sumer residence of Dalai Lama. The highlight here is the New Summer Palace (Takten Migyu Potrang) within. Stay till 1pm (when it closes). Plan for a quick lunch. Then take a 15 min taxi ride to Sera Monastery (色拉寺). Arrive by 1:45pm. Your objective is to see the monks debate in Tibetan, usually in a garden next to the assembly hall in the center of the monastery. The debate usually takes place between 3:30-5pm (or 2-4pm) daily except Sunday. Take a bus or taxi back to Lhasa. Hotel pick up at 8am. Drive 4 hrs via Land Cruiser to Nam-Tso (纳木错) Lake. Arrive by 12noon. Leave at 2pm. Then head to Yangpachen Hotspring. Back to Lhasa by 6pm or stay at Nam-Tso Lake overnight. If Nam-Tso Lake is closed due to bad weather, arrange a day trip to Yamdrok Lake instead. Both lakes are considered sacred in Tibet, and the water there is so pure and blue that we dare not to touch them. We don’t want to pollute such a sacred and beautiful lake just by touching it with our bare hands. Day 6: Day of departure. Early morning flight out of LXA. Wear a coat and keep some gloves with you. The airport doesn’t always turn on the heat! Now that you know our itinerary, next week we will share with you a few things that surprise us about Tibet. Did you like this post? Subscribe via email or RSS so you don’t miss an update! We’ll be highlighting our trip to Tibet this month. Whether the accusation above is true or not, we want to start answering this question by first clarifying why we travel and most important of all and why we believe everyone should get out of their comfort zone and travel to understand the world around them. Sometimes, travelers get a bad rap. They go to a new place, pack the top tourist sites in the morning hours, snap a bunch of pictures, get back on the bus and go to the next place. To them, traveling is like a social proof that they have “seen” the country and they have all the pictures to prove that too. That is NOT why one should travel. Honestly, if the only objective you have to travel is to snap pictures in front of the “Eiffel Towers” of the world, then there are tons of photo software you can leverage to do that. Don’t waste thousands of dollars to go there. To travel (as opposed to vacationing), in our opinion, is only worth the money if the journey enhances your perspective of the world in some way. Do not trust any media or anyone to tell you what is happening on the ground elsewhere. Why? Because every article is influenced by the viewpoints and opinions of the author. Every word on the article has implied meanings that can sway how you think about a situation. For example take the case of a recent story about George Zimmerman who was accused of murdering a black teen. Was he the “victim of media persecution” or a “a murderer”? Depending on which of the labels you saw the media assign to him the most, you would have formed an opinion about who Zimmerman is, regardless of the real truth. You’ll begin to believe one side of the story based on the ‘facts’ the media reported. It would not be until a verdict in a competent judicial court (and sometimes even after that) that you will start to understand the real course of events. Unfortunately not all events go through the rigor of due process in a justice system thus leaving you to form an opinion on the information you get from whoever reports it. And that is the danger (and power) of media. Now, going back to why we promote taking a trip to Tibet. We strongly believe everyone should go there to see and determine for themselves the condition of Tibetans under the Chinese rule. If we didn’t believe in that, who are we to criticize those who blindly follow what state-controlled and supposedly free-speech media outlets say about any situation at all. Everyone has the right to see and make that decision for themselves. We Encourage You to Visit Tibet! If you have the opportunity, you should visit this amazing land and its people! It was an eye opening and intriguing visit for us. If you are planning a trip to Tibet, have a look at our Tibet itinerary that we will share on our next post. Hope it helps you out! We know this is a very passionate topic for some. What’s your view on taking a trip to Tibet? Last week, Pazu Kong, one of our favorite local hosts on our round the world tour, answered the top Tibet travel questions regarding the best places and time to go. Today, we will review the logistics of getting to Tibet, and share with you a sample travel itinerary. Disclaimer: We did not receive any compensation, discounts, or benefits for highlighting Pazu Kong, owner of the Spinn Cafe and Tours in Lhasa, Tibet, nor will we receive commissions for this post in the future. This is purely a post to help you travel to Tibet as well. Pazu: The situation right now is complicated and probably changing very fast. So let’s make a quick summary. March 2009: no permit is issued. March 2010: some permits are issued. March 2011: no permit is issued. March 2012: no permit is issued. The permit is usually resumed on 5 April every year. But, this year, the Tourism Bureau implemented a new rule that a group must have at least five people of the same nationality during May and June (probably July as well). So if you come as two people right now, you cannot get the permit. This is out of the ordinary and we hope the situation will get better in the next few weeks. OnTheGroundTravel: Once in Tibet, are there any regulations that travelers need to be aware of? Pazu: Always listen to your tour guide for advice. To the extent possible, we always hope to give travelers more freedom. I can assureyou that the tour guides are not monitoring you, and they are not the same as the tour guides in North Korea. However, the tour guides would not be very happy if the travelers broke any rules that seem offensive to the government. You should be aware that both the tour guides and the tour agencies will be held responsible for any offense made by the travelers. For example, if the travelers were found walking around the Barkhor wearing t-shirts with political messages, the tour guide and agency would be suspended. OnTheGroundTravel: If someone can only stay in Tibet for a short period of time, what are the must-see sights? Pazu: If one only has five days, I think it would be nice to spend most of the time in Lhasa, then one day as a day trip to the nearby lakes, e.g. Namtso Lake or Yamdrok Lake. If one has six days, then adding a day trip to Ganden Monastery would be a great idea as well. OnTheGroundTravel: For folks who want to visit Tibet and the Everest Base Camp, what’s the best route to get there? When should they visit, and how many days would they need? Pazu: A trip to the Everest should take at least 8 days, but better be 10 days, including the time for acclimatization in Lhasa, this is extremely important. Most people would actually be okay if they spend at least three nights in Lhasa before going to the Everest, but do not attempt to go on the second or third day. It’s not a good idea to be too “ambitious.” And as I mentioned before, there is actually quite a lot to see in Lhasa. OnTheGroundTravel: Perfect. Thank you, Pazu, for all your insights on traveling in Tibet. Are you planning a visit to Tibet? Want to learn more about our adventure there? Then stay tuned for our destination review on Tibet in July. Comment and let us know if you have any other questions. Or… if you have been there already, we want to know how it went! We are very happy to have Pazu Kong, one of our favorite local hosts on our round the world tour, to answer your top Tibet travel questions. Today, we will address some of the most common questions on best places and time to visit Tibet. Then next Wednesday, Pazu will share his recommendations on the logistics of how to get to Tibet. He’ll even include a sample travel itinerary that you’ll find very valuable too! Now, let’s be honest. Traveling to Tibet is not easy. If you thought getting to Tibet was hard, just wait until you try and get into Tibet. There are a number of travel requirements that one must satisfy in order to be allowed in, many of which seem to change way too often. But, for you few persistent and fortunate souls who manage to get in, what you will see in Tibet is a timeless place where spirituality takes precedence over morality, a place where we come to terms with the harsh reality of life there and hope to achieve the ultimate goal of enlightenment. Disclaimer: With this glowing review, you must be wondering what’s in it for us to recommend Pazu? Well, nothing. We are not related, and we received no compensation or special treatment whatsoever. In fact, this post is written months after we left Tibet, and is purely there to help you travel to Tibet as well. OnTheGroundTravel: Tell us about how you discovered Tibet and ended up settling there. 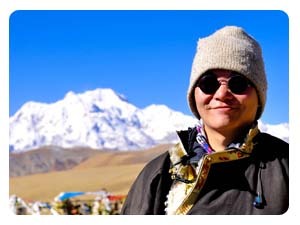 Pazu: I was born in Hong Kong and came to Lhasa as a traveler in 2001. At the time, I stayed in Lhasa for 3 months, discovered that I really loved it and decided to travel to other Tibetan areas for another 6 months, learning the Tibetan language and culture. After I left Tibet, I always thought of coming back to Lhasa so I bought a bicycle and cycled from Bangkok, Thailand to Lhasa, Tibet. The cycling trip took 6 months. Once in Lhasa, I opened Spinn Cafe and Tours and settled down in Lhasa most of the time. OnTheGroundTravel: Tibet is absolutely stunning. Where is your favorite place in the region? Pazu: My favorite place is actually Lhasa. A lot of travelers pass it as a transit point, going to Everest Base Camp or Samye, but I do like Lhasa a lot. The Barkhor Circuit is a fascinating place, with lots of old and traditional buildings to hang around for many months. I remember walking down an alley one day with my Tibetan friend and I was surprised. I thought I knew all the streets in Barkhor, but somehow my friend showed me yet another new path. This is what makes Barkhor so interesting, like a maze, with so many small temples (some are less famous and free to enter). Not far away from Lhasa lies several villages, I hopped on my bicycle and cycled around with no destinations, just roaming around. We cycled up to a monastery on a mountain, spent some time reading. This is my most favorite way to spend time with my friends. There is always something interesting, I found it hard sometimes to concentrate on a book, then voila, I could finish it on top of a monastery in a mountain! There must be some special spiritual energy in the mountain. As I was born in a big city, while I love the rural side, city atmosphere is important to me. I love Lhasa as you can find good restaurants (Tibetan, western, muslim, vegetarian, Chinese, etc. ), good infrastructure (fastest internet in Tibet is of course in Lhasa), good bookshops (but I use Kindle most of the time, so this is not as important as in the past). OnTheGroundTravel: What is it about Tibet that most intrigues you? Pazu: People, definitely the people. Even an atheist Tibetan would have Buddhism implanted in their hearts (Well, most Tibetans are actually Buddhists, but theoretically speaking, government workers are supposed to be “atheist,” at least in the name anyway). It is interesting to see how people implemented the teaching of buddhism in practical life. The way how Tibetans interact with others, how not to take advantage of them, and how Tibetans believe in the working of karma, etc. OnTheGroundTravel: When is the best time to go to Tibet and why? Pazu: Let’s talk about the “worst” time to go to Tibet. It’s actually not worst, but I found August not very enjoyable indeed – too many tourists (its supposed to be good for business, but I think it’s overwhelmed.) The best months are May and June, October and November. These are the months with less tourists, not too cold or hot, most roads are opened, and hence simply the best time to come here. OnTheGroundTravel: What’s the weather like in Tibet? Pazu: No matter which month you come to Tibet, remember to bring enough warm clothes. Tibet can be cold and hot in the same day. Take Lhasa as an example, summer time (June to September) can be – 2 to 31 degrees Celsius in one single day. Raining is frequent. In winter time (November to April), it can drop to -10 to 18 degrees Celsius. In terms of clothing, it is best to take whatever you think is appropriate for an environment of around -5 degrees Celsius and 20 degrees Celsius. So yes, you will have to bring two sets of outfits. OnTheGroundTravel: What are the top mistakes that you think travelers make when planning to go to Tibet? Pazu: A lot of travelers thought of Lhasa only as a transit point, which is a mistake I think. There is simply so much to see here. It would be nice to give yourself at least 3 or 4 days in Lhasa, just to explore the town itself. It’s also a good idea to spend a few days in Lhasa as acclimatization. Nothing is actually worst (because you can always find something worse…), but… a serious mistake that some travelers make is to spend too little time for acclimatization, or do not listen to their body. I remember a young traveler who looked very sick, his friends thought he was sick, the driver knew he was sick, the tour guide was very worried, but the young traveler insisted to go to the Everest Base Camp. He had to turn back after leaving Lhasa for a few hours. I think this was a serious mistake. OnTheGroundTravel: When we were Lhasa last year, we were in the city for a few days, and were never bored so we definitely agree it’s a wonderful place to visit. Thanks for sharing! Next week we’ll pick your brain about how people can navigate the challenges with getting into Tibet so they too can experience Lhasa and nearby places! Are you planning a visit to Tibet? Come back next week on Wednesday, when Pazu will share his thoughts on making it into Tibet. Want to learn more about our adventure there? We’ll be writing a series on Tibet in July and you won’t want to miss that. Better yet, subscribe via email or RSS so you don’t miss an update! Comment and let us know if you have any other questions. Join for a daily dose of around the world adventure! We use a number of sites frequently to purchase items and services for our travel. Look at our short list. Smart Chip Credit Cards You Can Apply for in the U.S. Guest Post: Travel the world, just don't get scammed in London!